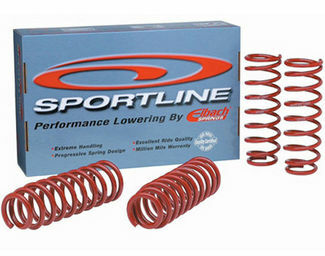 Enhanced Performance with Lowerings Springs!! There are few better ways to greatly improve both the visual appearance and handling of your car than to hook it up with a lowered suspension system. As standard, most consumer vehicles are fitting with suspension coils that prioritize ride comfort over every other variable. By fitting a set of aftermarket lowered springs, you can set up your vehicle to provide a distinctive look and more responsive handling. There's no denying that cars look better when they sit lower to the ground. 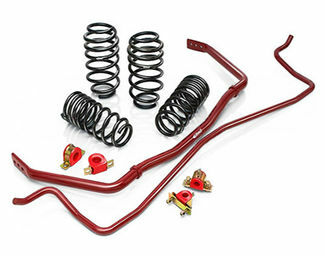 Installing a lowered spring set-up on any regular road car will instantly give it a sportier appearance without compromising the basic design flow of the vehicle. It's not a coincidence that some of the most beautiful cars in history sit low on the road, but cosmetics are not the only advantage that comes from lowering your car. The lower your car is, the lower its center of gravity will be. This leads to a noticeable improvement in driving stability and corner handling compared to a standard suspension set-up. You will also see an appreciable performance increase in regard to wind resistance and aerodynamics. Allowing your car to sit closer to the road reduces the amount of air that can pass under it, which also greatly increases downforce while reducing wind resistance. You can also expect to see a smoother acceleration experience as the lowered wind resistance reduces wind buffeting. Even your vehicle's fuel economy will benefit from this reduction in drag. A final benefit of lowering springs comes in the form of a safety measure. The rollover risk of a lowered car is greatly reduced. Not only does the lower suspension give you crisper handling while tackling corners, but you are much less likely to end up rolling the vehicle. An object with a low center of gravity is inherently harder to topple than an object of the same mass with a higher center of gravity. 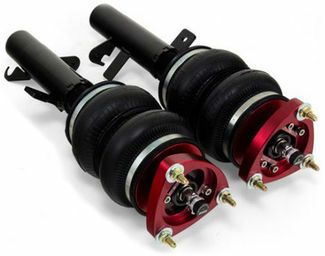 Eibach Springs is the go-to name for lowered suspension systems. They are renowned for producing race-quality systems that are safe, reliable and effective. If you've ever watched professional motor racing, the chances are you've seen Eibach springs in action. They have a long and impressive history of involvement at the very top levels of motorsport, from the World Rally Championship to NASCAR and even Formula One. 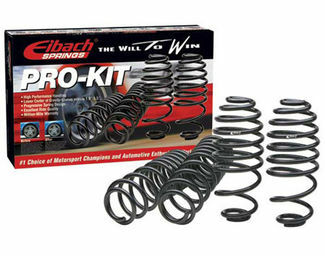 Eibach offers two main flavors of design, the Pro-Kit series springs, which is their standard lowering system, and a Sportline system, which is best described as the Pro-Kit dialed up to 11, offering an even lower ride. Air Lift Performance is another manufacturer with serious pedigree. Starting out in post-war Michigan, Air Lift has almost seven decades of experience creating some of the finest aftermarket suspension systems on the market. You might recognize Air Lift products under the name Easy Street, a moniker which Air Lift used throughout the 1990s when lowered cars really shot to prominence. Both Eibach and Air Lift Performance primarily cater to the custom car market, specifically performance vehicles, however, some models of SUV can also be fitted with lowered springs.